So how do you put handcuffs on one of these? Blogger NBC has done some excellent research and seems to have identified the source of the White House LFBC PDF. 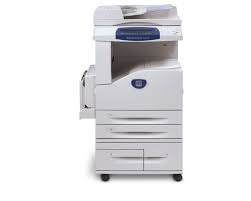 It is a dastardly Xerox WorkCentre multifunction machine located deep within the White House. I won’t go in to the specific details here but will list the series of blog posts that NBC has written detailing his research into the details of the PDF and his proposed work flow consisting of first scanning one of the original certified copies on a Xerox WorkCentre (most likely a Model 7655) followed b y a rotation and resaving to a PDF on a Mac using Preview. The latest findings seem to explain several anomalies that the CCP claimed could not be result of a normal office work flow type process. I will detail those but first let’s look at the big picture. The CCP is made some very extraordinary and damning claims. Despite the multiple verifications by the state of Hawaii the CCP is accusing the President of the United States of being a criminal. They are too chicken to come right out and say it but that is what Mike Zullo has implied over and over. If the birth certificate posted on the White House web site is a “forgery” then the President would certainly know it. So would two Hawaii administrations, one from each party. It is an extraordinary claim requiring extraordinary evidence. They weasel out of a direct accusation by not naming the supposed forger and through claims they really want the truth. Just recently Mike Zullo said on Alex Jones Info Wars program that he first became suspicious about the LFBC when he watch an Alex Jones video. Wow, so Zullo believes one of the biggest conspiracy nuts out there. I assume Zullo also buys into Alex Jones nonsense that the Boston Marathon bombing victims were actors. This is a summary of what NBC and others like W. Kevin Vicklund who comments there have found. For the details please follow the link posted below to NBC’s blog for his continuing series of articles on the workflow for the LFBC. Xerox WorkCentre office machines scan documents and compress the file using a form of MRC compression which breaks down a document like the LFBC into a color JPG compressed background layer and multiple one-bit monochrome masking layers compressed using a compression scheme called JBIG2. NBC first found other documents posted on the web that consisted of the same combination of layers that were created on a Xerox WorkCentre. This directly contradicted a Cold Case Posse claim made by Garrett Papit that MRC compression never contains more that a single one bit masking object. NBC discovered that documents scanned on the Xerox WorkCentre’s insert a comment “YCbCr” in the JPG object. This seems to be a feature of documents scanned on Xerox WorkCentres. NBC found it in the LFBC PDF. YCbCr refers to the way color space mapping is performed in some JPG files. NBC and Vicklund found Xerox patents confirming the that multiple one bit layers are employed. NBC discovered that the PDF of the Obama’s joint return scanned and posted on the White House web site was created on a Xerox 7655 WorkCentre. Xerox WorkCentre’s use an Edge Erase function by default that clips a small portion of the document all around to remove staple holes. This produces a white border of approximately 0.1” all around. This would explain the white border on the LFBC PDF and the differences in the Savannah Guthrie photo which shows the border to the edge of the paper. This anomaly was used to support forgery claims made by Mark Gillar. The original images produced by Xerox WorkCentres are sideways – the WorkCentre software corrects for this by rotating the images when it scans to pdf, but TIFFs are sideways. As this is the final step the WorkCentre performs in creating the pdf, all of the image compression and optimization is done on the sideways image. The LFBC itself shows the producer and creator is “Preview”. Preview is the PDF viewer in iOS on a Mac. NBC proposes that the the original certified copy of the LFBC was scanned and emailed on a Xerox WorkCentre 7655 then opened in Preview on a Mac. The document had to be rotated and was then printed to a PDF using Preview. This would account for the metadata showing “Preview” as the producer/creator. Preview adds a clipping mask (in which the page size remains the same but everything outside the mask is instead rendered as white). A reader scanned a printed copy of the WH LFBC on a Xerox WorkCentre. The resultant PDF, while not identical to the WHLFBC PDF had 16 objects consisting of a background JPG with the green basket weave and form and multiple one-bit masking objects. You could “move things around” when it was opened in Illustrator. The background even had the bleached out areas where stuff was moved to other objects (layers). When it is opened in Adobe Illustrator the image is sideways. This is also a clue that the scan was done on a WorkCentre as explained above. These are remarkable findings and there is more at NBC’s blog. The articles are fairly technical. That is why I tried to distill them down to the key findings in this post. Will Carl Gallups have Mike Zullo on his “Freedom Friday” show to do a mea culpa and apologize to the President? I am not holding my breath. Update: I added two points based on the comment by W. Kevin Vicklund. This entry was posted in Barack Obama, Birth Certificate, Conspiracy Theories and tagged Birth Certificate, Birthers, Carl Gallups, Cold Case Posse, Mike Zullo, Xerox. Bookmark the permalink. I’m sure, being the crack law enforcement investigators that they are, the CCP will acquire access to a Xerox WorkCentre 7655, and attempt to duplicate the exercise. THEN they will apologize and withdraw the claims of fraud and forgery. I’m sure you really meant the “President of the Untied States” instead of the “President of the United States”. Thought you could slip that one by the Birthers did you RC the RadioHead? Thanks for finding my typo Hermie. This is devastating news for Zullo isn’t it? Hermie, I found a way you can ruin some of the debunkers fun. You could volunteer to proof read Orly’s filings. This would give us less amusement while reading. The key term is volunteer. Don’t expect Orly to pay or even acknowledge your existence. The authenticity/bona-fides of Obama’s BC,or lack thereof ,is irrelevant in Obama’s case in light of the fact that a “Natural-Born Citizen” is required to be born on U.S. soil AND to have Parents who were BOTH American Citizens themselves when Obama was born. Obama’s father was a Foreigner.,never naturalized. Obama is disqualified. You know this issue has been resolved by the courts don’t you? It wasn’t decided the way you wanted either. You lost yourself in NY Robert. It is over. In item 1, it’s JBIG2, not JBIG. There’s a significant difference in what the two algorithms can do. Two other key items to consider adding: Preview adds a clipping mask (in which the page size remains the same but everything outside the mask is instead rendered as white). Second, the original images produced by Xerox WorkCentres are sideways – the WorkCentre software corrects for this by rotating the images when it scans to pdf, but TIFFs are sideways. As this is the final step the WorkCentre performs in creating the pdf, all of the image compression and optimization is done on the sideways image. Thanks for you comments. I will edit the article today to reflect your points. Have you noticed that Mark Gillar and the Elecro Magnetic Punk guy disappeared? I bet the are rushing out trying to find a Xerox WorkCentre. I bet they are trying to find the oldest WorkCentre available, in hopes that it doesn’t have the features of the 7655. Preview is a program that allows a user to open and view a file (as the name suggests). Preview can view a range of file types created from other programs as well as allowing a user to resave the file in any file format available within Preview. Preview is limited in its abilities and certainly not a program used to create a layered file from scratch. The optimization argument becomes increasingly problematic when it is understood that Preview is incapable of producing or generating layers automatically from an optimization process (when saving a file). Preview will only maintain preexisting layers produced from another program. Thus Obama’s PDF layers had to be generated from another program prior to being saved from Preview. One more important point regarding Preview’s role in creating Obama’s PDF file: If a file is produced in another program; opened and saved again within Preview, the metadata from any prior programs used are replaced with Preview metadata, thus eliminating any digital tracks for the previous programs utilized in the process (such as Photoshop or Illustrator that might imply manipulation). As NBC has shown it is not accurate that Preview eliminates all the “digital tracks” from other programs that created files. It does replace the metadata. Obama’s PDF object code properties cannot be reproduced without manufacturing and manipulating layers. Any layers produced through optimizing will result in a single 1-bit layer. Repeat: JUST ONE 1-bit layer—not eight. In the case of adaptive compression, the color on the 1-bit layer will reflect a black color value—not off-white, not greenish-black, nor greenish-gray (as displayed in Obama’s PDF file). Garrett Papit made a similar claim in the comments at John Woodman’s blog and was quickly shown to be wrong when several people found information that there were implementations of MRC that used more than a single 1-bit mask. As I recall Papit disappeared at about that point.